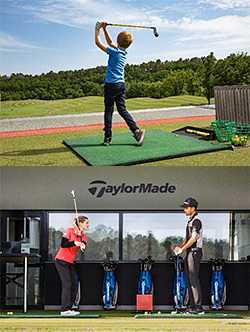 Terre Blanche Resort is thrilled to announce the opening of the Terre Blanche Golf Academy, which launched on 1 January 2019 in the heart of Provence’s Côte d’Azur. Awarded No. 1 Golf Resort in Continental Europe 2018 by Golf World Magazine UK, the resort is a hub of excellence recognised at an international level and top destination for golfing professionals and amateurs globally seeking the best facilities, equipment, teaching methods and services. The brand new campus and fitness centre will offer a host of newly curated programmes, inviting experienced amateurs and professionals to enroll in intensive training courses that range from 4 to 10 weeks. Each provides an unparalleled combination of biomechanical analysis, physical and mental coaching, giving players a unique opportunity to improve their skills and performance using state-of-the-art facilities. The Albatros Golf Performance Center, the only European Tour Performance Institute certified in Europe, houses the coveted Biomecaswing Center, headed by the renowned Jean-Jacques Rivet. Utilising the latest biomechanical technology, the Biomecaswing concept provides customised programmes based on kinetic analysis of the body, a physical assessment and a precise analysis of a player’s balance and gestures that allows players to refine and optimise their game. To date, it is unique to the resort and there is no equivalent in Europe (possibly world-wide). A Leading Hotel of the World, the five-star resort is home to two tree-lined and undulating 18-hole championship golf courses, ‘Le Château’ and ‘Le Riou’, designed by renowned Welsh architect Dave Thomas to incorporate the natural Provencal terrain and stunning water features. The resort is committed to the environment and is one of only seven golf clubs in France to be GEO Certified® (Golf Environment Organisation). Off the course, guests can experience Michelin-starred dining at restaurant Le Faventia, relax at the award-winning spa, enjoy the azure infinity pool with panoramic views over the surrounding Provencal landscape and a myriad of activities within and around the resort. These include visits to the perched medieval villages, tasting authentic Provencal wines and olive oils, horse riding, mountain biking, cooking lessons, pottery and hiking. Rates dependent on activity. Digital brochures available. At the end of the 1990s, Dietmar Hopp discovered the exceptional landscape of Terre Blanche and fell in love with what was then a dreamlike plot of woodland from a project never completed. The avid golfer and entrepreneur had great vision for what the immense space could become. Today, the stunning location that is now Terre Blanche Hotel Spa Golf Resort reflects the passion of Hopp’s dream, while preserving the fragile balance of its natural surroundings. An environmentally aware and carefully built resort and golf centre, Terre Blanche aspires not only to provide the upmost quality experience for its guests but also to enhance the economy and tourism of the region.